Results: In recent decades, the Arctic has been experiencing warming twice as large as the global averages. However, the uncertainty in climate model simulations and future climate projections is much larger in the Arctic than throughout the rest of the globe. In a recent study by PNNL researchers and colleagues at Lawrence Livermore National Laboratory, a new method for representing the microphysics of mixed-phase clouds in model simulations showed significant improvement when compared to actual observations. These improvements will help improve the accuracy of climate models due to more realistic cloud representations and the resulting energy feedbacks. Their study was published in Geophysical Research Letters in December 2007. Why it matters: Arctic clouds play a central role in Arctic climate feedbacks and the energy balance, but are not well represented in current climate models. This is partially because mixed-phase clouds—composed of both ice and water—are prevalent in the Arctic, but have not been studied to any great detail. Conventional model methods, or schemes, use temperature to determine how much water in mixed-phase clouds is liquid or ice—liquid in warmer temperatures and ice in colder temperatures. However, this methodology does not reflect recent observational data of Arctic clouds, which show the opposite trend of liquid dominating near the tops of the clouds, which are generally colder, and precipitating ice near the cloud base. These model differences can have large effects on the phase, lifetime, and radiative properties of the clouds. Methods: The team evaluated a new physically-based mixed-phase cloud microphysics scheme for representing ice nucleation and water vapor deposition using the National Center for Atmospheric Research climate model running in the single column mode and in the CAPT weather forecast mode. Simulations were compared against observations obtained during the Mixed-Phase Arctic Cloud Experiment (M-PACE), conducted in Barrow, Alaska in October 2004. 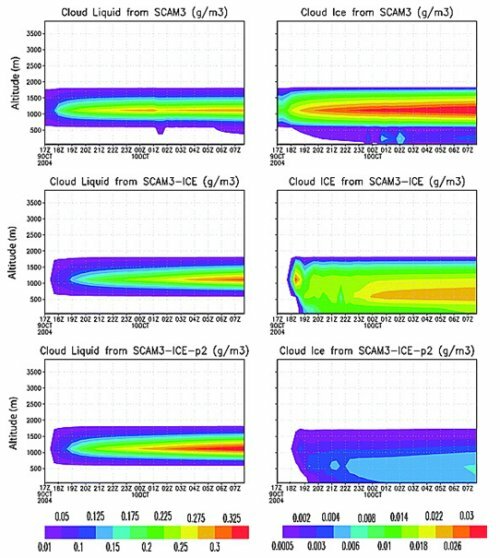 Results from both model configurations showed that the new cloud microphysical scheme produced more realistic simulations of the cloud phase structure and the partitioning of condensed water into liquid droplets against observations during M-PACE than the standard climate model with an oversimplified cloud microphysics scheme. The standard model significantly underestimated the mixed-phase cloud fraction in the observed boundary layer, but improved considerably when using the new scheme. The new scheme also led to improved simulations of radiative energy at the surface and top of the atmosphere. What's next: In order to realistically simulate the vertical cloud structure in mixed-phase clouds for large-scale models, explicit treatment of ice formation and liquid conversion to ice via the Bergeron-Findeisen process should be considered. This process is used to describe how ice crystals govern the formation of precipitation in cold clouds of the mid and upper latitudes. Global radiative forcing and climate feedbacks using these methods are also under investigation. Acknowledgments: The research team included Xiaohong Liu and Steve Ghan from Pacific Northwest National Laboratory, and Shaocheng Xie, Jim Boyle and Steve Klein from Lawrence Livermore National Laboratory. Their research was funded by the DOE Office of Science, Office of Biological and Environmental Research. 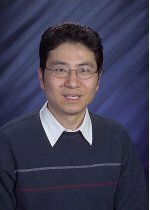 References: Liu, X., S. Xie, and S. J. Ghan. 2007. 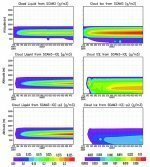 Evaluation of a new mixed-phase cloud microphysics parameterization with the NCAR single column climate model (SCAM) and ARM M-PACE observations, Geophysical Research Letters, 34, L23712, doi:10.1029/2007GL031446. Xie, S., J. Boyle, S. A. Klein, X. Liu and S. Ghan. 2008. Simulations of Arctic Mixed-Phase Clouds in Forecasts with CAM3 and AM2 for M-PACE, Journal of Geophysical Research D 113(D4):Art. No. D04211.